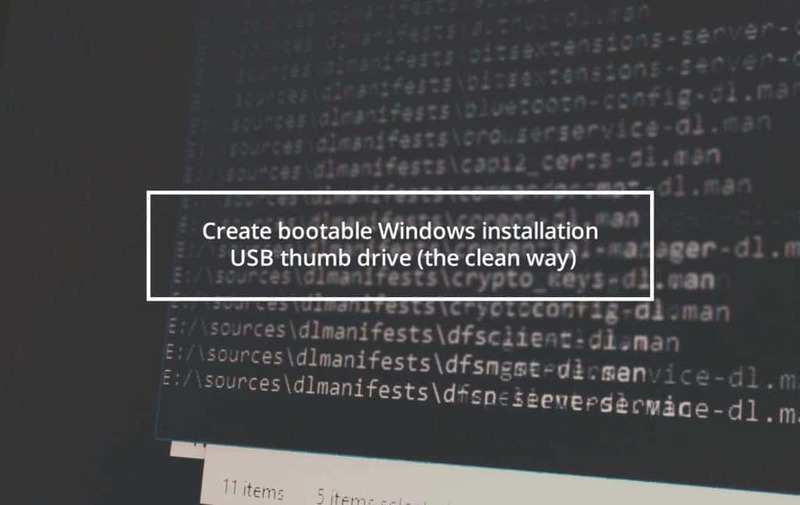 In this tutorial, we are creating a bootable USB thumb drive on Windows system for installing another Windows to any desktop or laptop. Stick in empty USB thumb drive to the computer. Type LIST DISK which will list your disks. USB drive is the smallest, mine is 15 GB. To choose the USB thumb drive, type SELECT DISK X. Your disk could be Disk 1-3 but you need to check the disk based on disk Size. 4 GB disk could be displayed as 3490 MB for example. Mine is 15 GB this time. Be extra careful, because if you choose the wrong disk, for example, your hard drive instead of the USB thumb drive, you could format your entire hard drive clean. I don’t take responsibility of that. Type these commands in this particular order: CLEAN, CREATE PARTITION PRIMARY, SELECT PARTITION 1, ACTIVE, FORMAT FS=NTFS. These commands will format the USB drive to NTFS and create the primary partition for it. This could take a while, but you’ll see the progress directly. Type ASSIGN and right after EXIT. Now we have a bootable drive. Download the free version of DAEMON Tools Lite, install (use the free licence, decline Wajam and other possible adware, choose Custom installation and don’t install adware like PC Mechanic) and run DAEMON Tools Lite after installing. Make virtual drive of Windows image file by choosing Images and plus icon (Add Image). Locate your Windows image .ISO file. Right click on the disk icon and choose Mount. And we’re done! Because this is a clean way to do this (raw commands instead of any buggy software), it always works. If not, you did something wrong or the issue is with your computer (for example I once had old BIOS that wouldn’t boot). Now you can stick the USB drive into the computer you need to install Windows and start installing.